Welcome to the most complete UVM Online resource collection. Here you'll find everything you need to get up to speed on the UVM including; UVM Framework and UVM Connect. Whether it's downloading the kit(s), discussion forums or online or in-person training. The UVM Academy Courses provide a great overview of the introductory and advanced methodology concepts, including videos that walk you through some useful code examples. The Verification Methodology Cookbook is an online textbook, which we keep constantly up to date, to show you in more detail how to use the various features of the methodologies to create reusable verification components and environments. In this course, we examine common UVM debug issues, and provide a systematic set of recommendations to effectively address them. The SystemVerilog OOP for UVM Verification course is aimed at introducing the OOP features in SystemVerilog most commonly used by the UVM in the simplest form. The Introduction to the UVM course consists of twelve sessions that will guide you from rudimentary SystemVerilog through a complete UVM testbench. 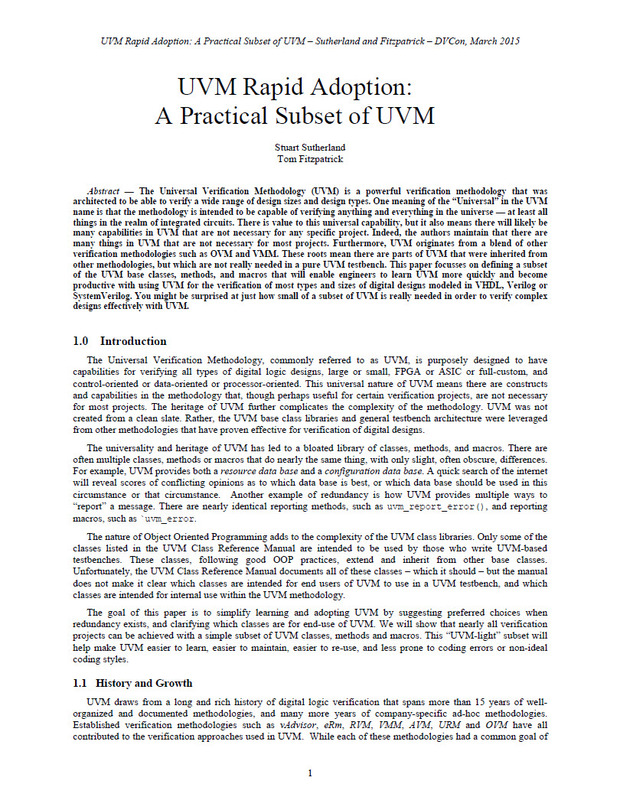 Basic UVM should raise a user's level of UVM knowledge to the point where users have sufficient confidence in their own technical understanding that it becomes less of a barrier to adoption. This session will start with an overview of the changes in UVM 1800.2 from UVM 1.2 and 1.1d so you can be prepared to embrace the new Standard. To accompany this release, we have updated the online UVM Cookbook both to take advantage of some of the new features in UVM and also to guide you in creating testbenches that can be reused in all available engines, including emulation. You will learn how to outline key characteristics of a reuse verification library and will outline a proven reuse methodology. This Verification Cookbook seminar, we will walk through the mechanics of setting up and executing Slave Sequences in a responder. This Verification Cookbook seminar will teach you everything you need to know about the future of UVM including new features, performance, backward-compatibility concerns and more. Today’s advanced UVM environments require more than a standard BFM to support environment reuse, randomized stimulus, generation of traffic scenarios, coverage collection, etc. This Verification Cookbook seminar will introduce you to abstract stimulus specification to provide more effective UVM tests that can be reused throughout your SoC flow. This Verification Cookbook seminar will introduce the UVM Register Assistant showing how to generate correct-by-construction register models and tests from a register specification. This Verification Cookbook seminar will highlight some new strategies for debugging UVM-based testbenches. This Verification Cookbook seminar describes a technique in which C stimulus can be applied to the DUT via an existing UVM testbench that contains one or more bus agents. This Verification Cookbook seminar will outline the proper architecture of scoreboards and predictors in UVM and how they relate to coverage. This Verification Cookbook seminar will show you how to maximize your ability debug your testbench so you can get on with the real task of verifying your design. This Verification Cookbook seminar introduces UVM Connect; providing TLM1 and TLM2 connectivity and object passing between SystemC and SystemVerilog UVM models and components. This Verification Cookbook seminar will review the configuration database feature of UVM and show you how to organize your testbench to maximize flexibility. This Verification Cookbook seminar will expand on the introductory session and will discuss how to implement registers and also review score-boarding at the register layer. This Verification Cookbook seminar will provide an introduction to the Register Layer and show you how to get started writing tests and sequences and checking results at the register layer. This Verification Cookbook seminar will show how to deconstruct sequence items and sequences across the protocol hierarchy and how to encapsulate each layer to preserve reuse. In this learning path you will learn how to use the Universal Verification Methodology (UVM) to create reusable verification environments. Learn how to create UVM test classes and complex sequences to control other sequences.